Eric Clapton wrapped up his last of his scheduled live performances at the world’s most famous arena Madison Square Garden on Sunday October, 7. The three-time Rock and Roll Hall of Fame inductee played with passion as if he had something to prove. Clapton has been battling recent health issues, primarily peripheral neuropathy, a nerve disease that causes tingling in extremities and painful “shocks,” which he was diagnosed with in 2013. Clapton also revealed that he was going deaf and that he suffers from tinnitus in an interview with BBC 2 earlier this year. After concluding his 50th anniversary tour last year, Clapton has since retired from touring and only plays one off dates. 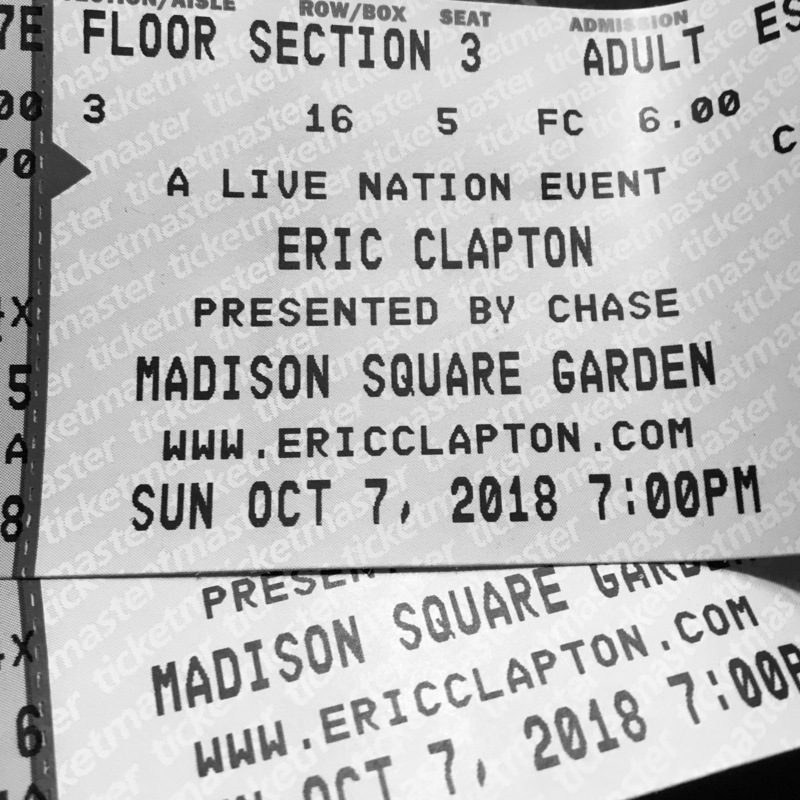 Despite his recent adversity, Eric Clapton delivered a 90 minute career spanning set that hopefully won’t be the last time Slowhand takes the stage. Clapton took the stage just after 8 p.m. with his band composed of drummer Sonny Emory, guitarist Doyle Bramhall II, keyboardist and vocalist Paul Carrack, keyboardist Chris Stainton and singers Sharon White and Sharlotte Gibson. Eric took a brief moment to look out into the crowd before reaching for his signature black Fender Stratocaster and opened up with “Somebody’s Knocking,” which was an unreleased J.J. Cale cover he recorded during his 2016 sessions for twenty-first studio album I Still Do. Clapton worked through notable numbers like “Key To The Highway” and Willie Dixon’s “Hoochie Coochie Man,” which was first made notorious by Muddy Waters. Clapton’s guitar playing sounded as good as ever, and while he may not play with the same energy or flamboyancy as he has in the past, the 73-year-old icon proved why he’s widely considered one of the best guitar players ever. Eric and company eased into an upbeat reggae cover of Bob Marley’s “I Shot The Sheriff” which injected a burst of energy into the crowd. Clapton is no stranger to this Marley original, as he’s been playing it consistently since he recorded a studio version for his 1974 album 461 Ocean Boulevard. After the four song combination punch concluded, Eric oped for his acoustic Martin guitar and took a seat at the skirt of the stage where he slowed things down with “Drifting” > “Nobody Knows You.” It was absolutely remarkable to see a man commend a room the size of Madison Square Garden with nothing but six strings and his voice. The crowd didn’t have to wait long to hear two of his most iconic songs played back to back when Eric played “Layla” > “Tears In Heaven” to close out the acoustic portion of his set. As the rest of the band returned to the stage, Eric traded his Martin for his electric and dropped “White Room,” one of his most notable songs during his tenure with Cream. The crowd erupted in emotion as it felt like a tidal wave of energy had fully engulfed the room. Clapton and company shifted down a few gears as they played a stunning version of “Wonderful Tonight,” a ballad that first appeared on Clapton’s 1977 Slowhand album. The band tipped their hats to Blues legend Robert Johnson as they played “Crossroads” and “Little Queen of Spades” before closing out their set with “Cocaine,” which prompted a robust sing-a-long participation from the audience. Clapton enlisted the help of his two opening acts Jimmie Vaughan (brother of late Stevie Ray Vaughan) and Gary Clark, Jr. for a rousing version of “High Time We Went” which featured Paul Carrack taking the lead vocals as all three guitarists took turns adding many textures and layers of solos. When is was all said and done the audience had witnessed one of the best musicians to every wrap his hands around a guitar. Eric Clapton’s music is a testament to the adversity he’s overcome and his legacy will be forever cemented as one of the best of all time. video courtesy of Jim Powers. Jennifer Hartswick and Nick Cassarino at Pearl Street Warehouse in D.C.